Click here to save and/or to print out this booklet as a simple text file. 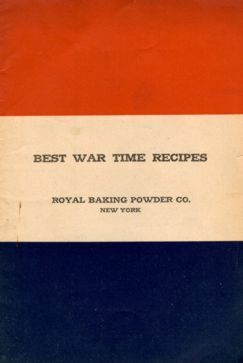 47+ recipes that saved eggs, butter, milk, and wheat flour for our allies in Europe who were staving in some instances. Wheat flour was not to be used, if possible, because we shipped the wheat in sacks to Europe. 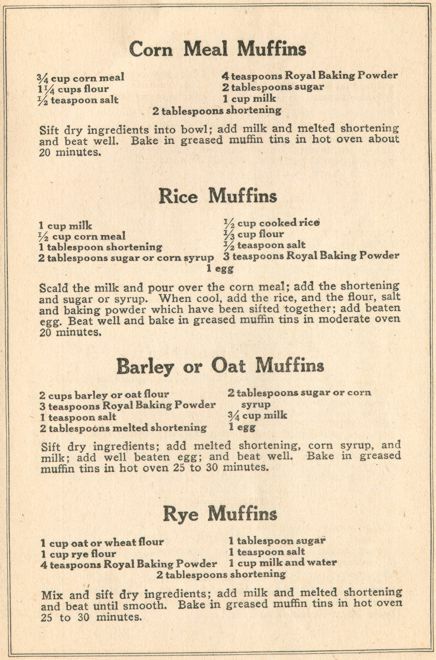 Corn flour and other coarse (barley, buckwheat, graham, oat, or rye) flours were to be used. 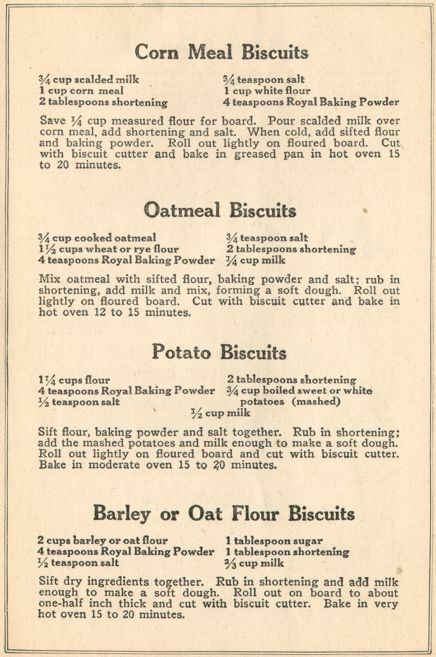 When wheat flour was used corn meal, cereals, hominy, peanuts, potatoes, and coarse flours were also used to reduced the total amount of wheat flour used. See my notes on ingredients at the bottom of page. The booklet pages were not numbered. 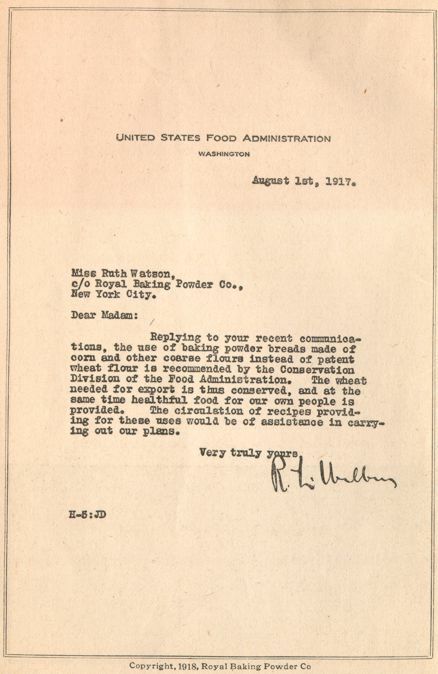 Letter to the Royal Baking Co. from the U.S. Food Administration. 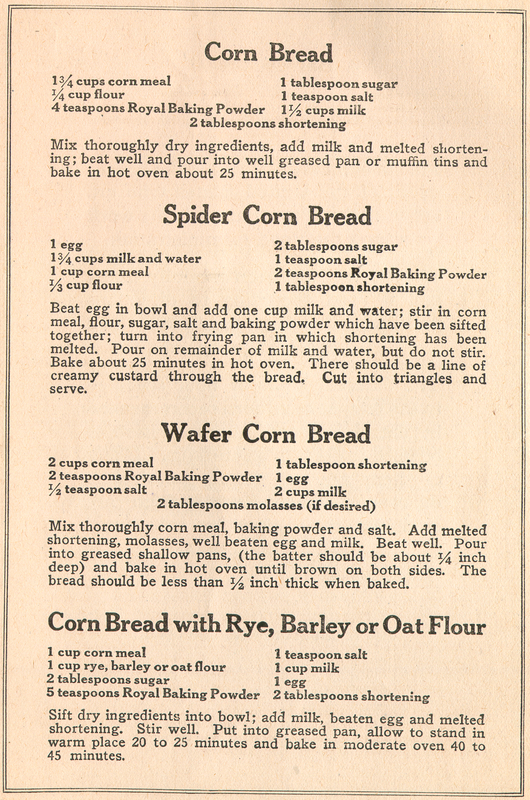 Page 1 - Corn Bread; Spider Corn Bread; Wafer Corn Bread; and Corn Bread with Rye, Barley or Oat Flour. 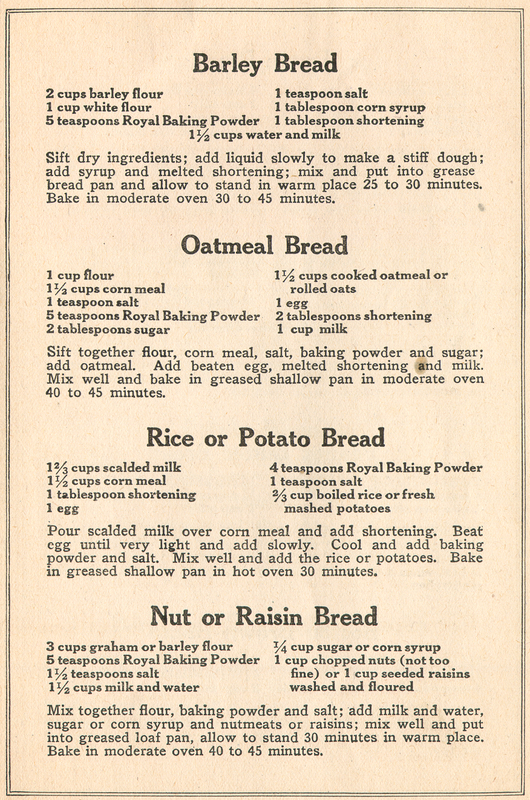 Page 2 - Barley Bread; Oatmeal Bread; Rice or Potato Bread; and Nut or Raisin Bread. 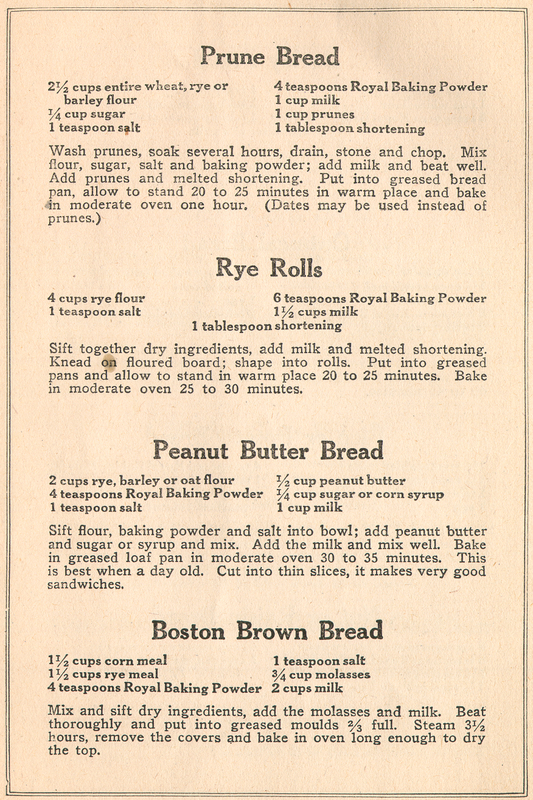 Page 3 - Prune Bread; Rye Rolls; Peanut Butter Bread; and Boston Brown Bread. 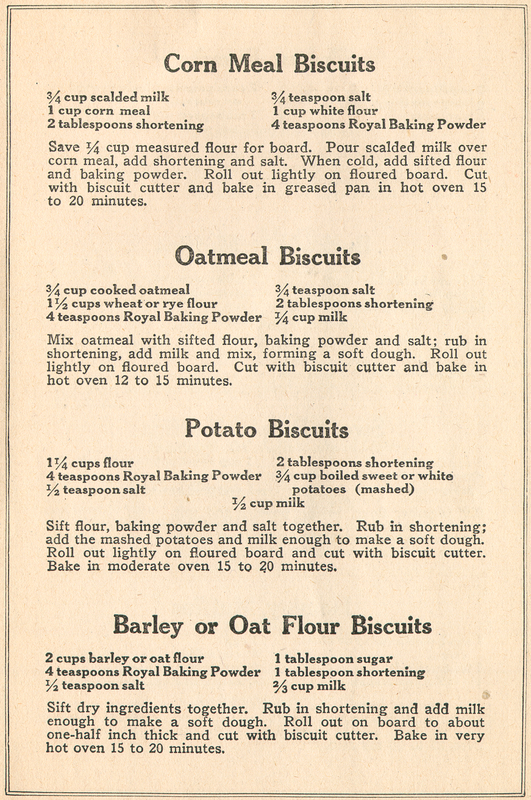 Page 4 - Corn Meal Biscuits; Oatmeal Biscuits; Potato Biscuits; and Barley or Oat Flour Biscuits. 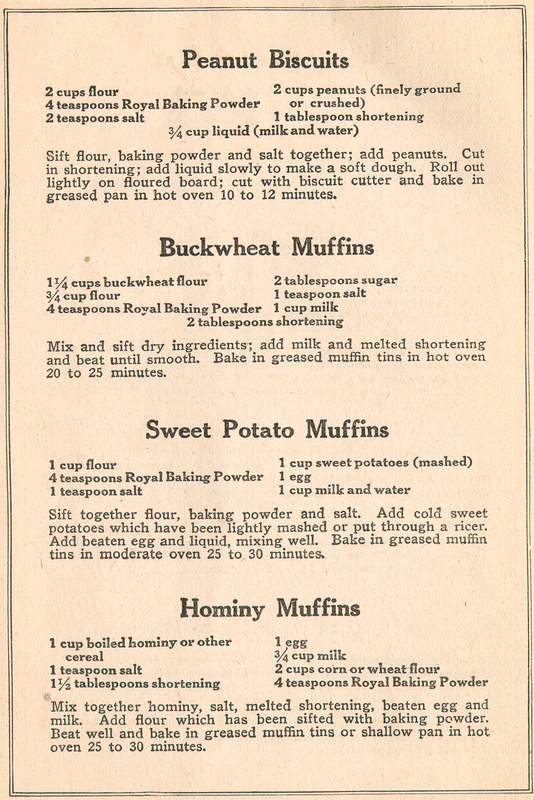 Page 5 - Peanut Biscuits; Buckwheat Muffins; Sweet Potato Muffins; and Hominy Muffins. 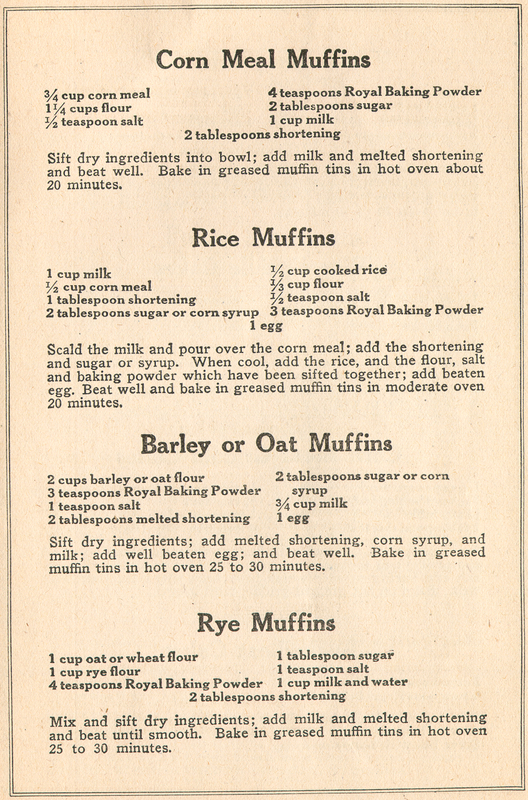 Page 6 - Corn Meal Muffins; Rice Muffins; Barley or Oat Muffins; and Rye Muffins. 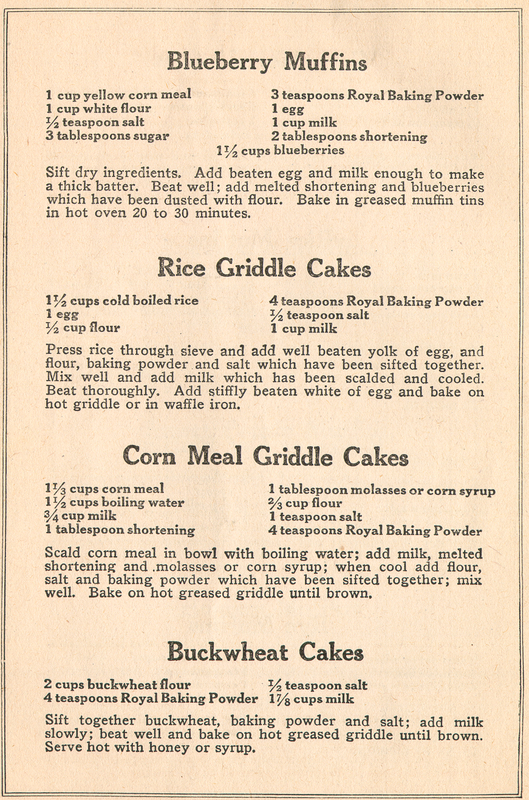 Page 7 - Blueberry Muffins; Rice Griddle Cakes; Corn Meal Griddle Cakes; and Buckwheat Cakes. 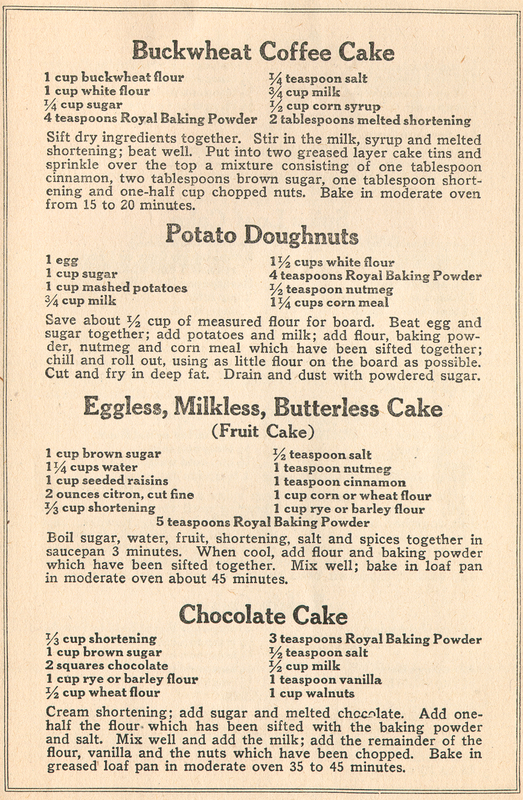 Page 8 - Buckwheat Coffee Cake; Potato Doughnuts; Eggless, Milkless, Butterless Cake (Fruit Cake); and Chocolate Cake. Page 9 - Prune Cake; Spice Loaf Cake; Royal Sponge Cake; and Raisin Cakes. 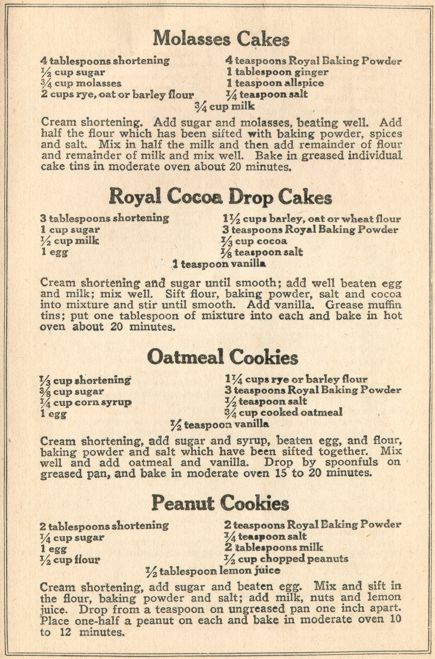 Page 10 - Molasses Cakes; Royal Cocoa Drop Cakes; Oatmeal Cookies; and Peanut Cookies. 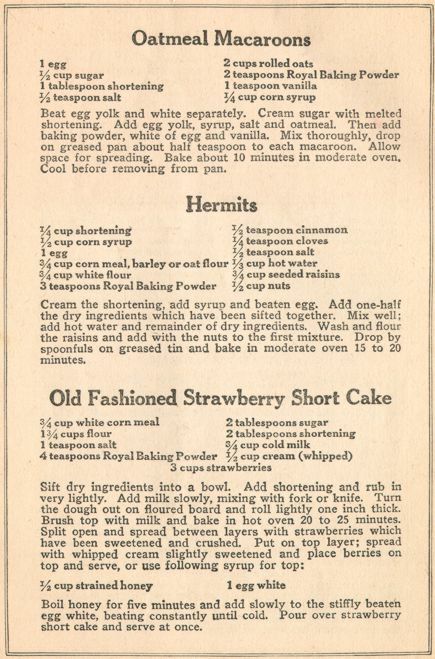 Page 11 - Oatmeal Macaroons; Hermits; and Old Fashioned Strawberry Short Cakes. 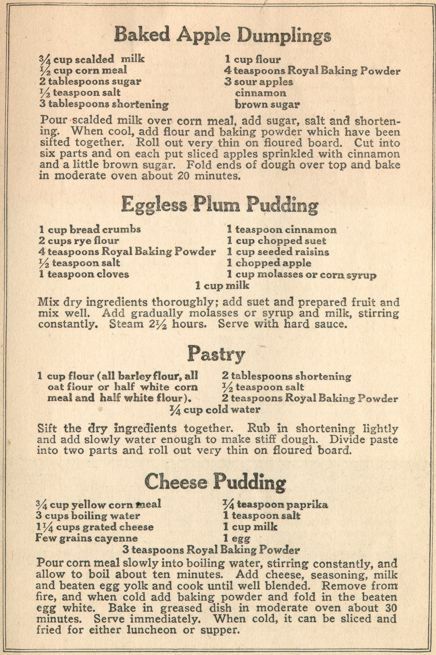 Page 12 - Baked Apple Dumplings; Eggless Plum Pudding; Pastry; and Cheese Pudding. For those of you who wish to verify recipes, you can view the actual pages of booklet. I have not had anyone volunteer to proof-read this web page, yet. 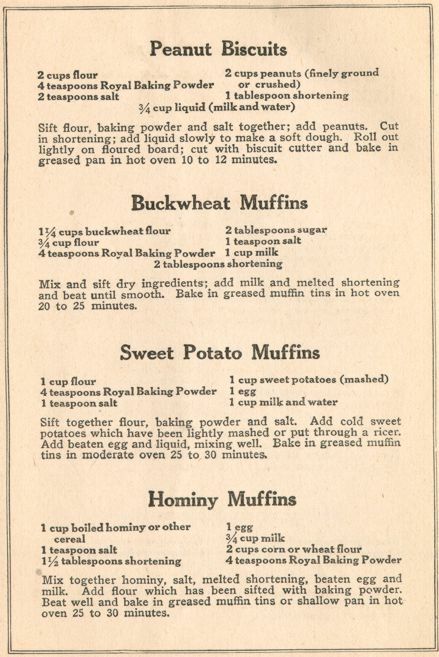 Copyright, 1918, Royal Baking Co.
c/o Royal Baking Powder Co.
Replying to your recent communications, the use of baking powder breads made of corn and other coarse flours instead of patent wheat floor is recommended by the Conservation Division of the Food Administration. The wheat needed for export is thus conserved, and at the same time healthful food for our own people is provided. The circulation of recipes providing for these uses would be of assistance in carrying out our plans. 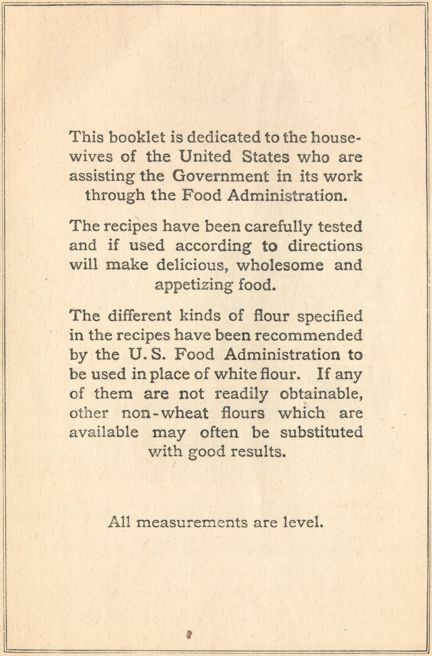 This booklet is dedicated to the housewives of the United States who are assisting the Government in its work through the Food Administration. The recipes have been carefully tested and if used according to directions will make delicious, wholesome and appetizing food. 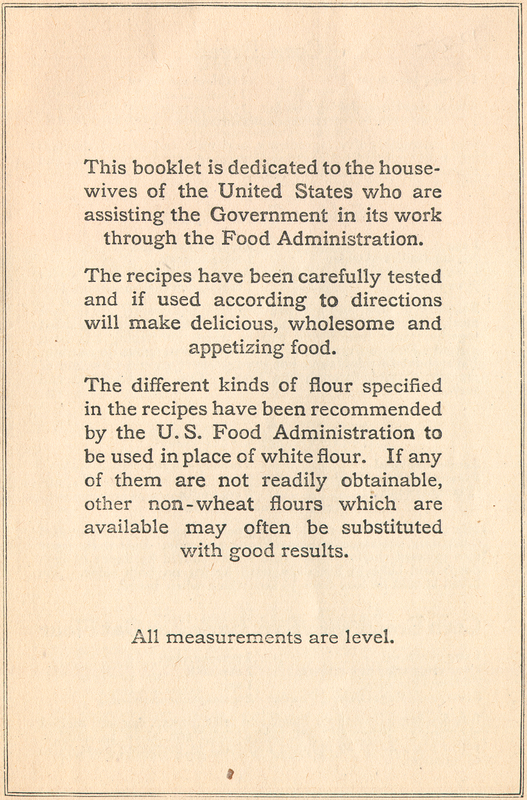 The different kinds of flour specified in the recipes have been recommended by the U. S. Food Administration to be used in place of white flour. If any of them are not readily obtainable, other non-wheat flours which are available may often be substituted with good results. Mix thoroughly dry ingredients, add milk and melted shortening; beat well and pour into well greased pan or muffin tins and bake in hot oven about 25 minutes. Beat egg in bowl and add one cup milk and water; stir in corn meal, flour, sugar, salt and baking powder which have been sifted together; turn into frying pan in which shortening has been melted. Pour on remainder of milk and water, but do not stir. Bake about 25 minutes in hot oven. There should be a line of creamy custard through the bread. Cut into triangles and serve. Mix thoroughly corn meal baking powder and salt. Add melted shortening, molasses, well beaten egg and milk. Beat well. Pour into greased shallow pans, (the batter should be about 1/4 inch deep) and bake in hot oven until brown on both sides. The bread should be less than 1/2 inch thick when baked. Sift dry ingredients into bowl; add milk, beaten egg and melted shortening. Stir well. Put into greased pan, allow to stand in warm place 20 to 25 minutes and bake in moderate oven 40 to 45 minutes. Sift dry ingredients; add liquid slowly to make a stiff dough; add syrup and melted shortening; mix and put into grease bread pan and allow to sand in warm place 25 to 30 minutes. Bake in moderate oven 30 to 45 minutes. Sift together flour, corn meal, salt, baking powder and sugar; add oatmeal. Add beaten egg, melted shortening and milk. Mix well and bake in greased shallow pan in moderate oven 40 to 45 minutes. Pour scalded milk over corn meal and add shortening. Beat egg until very light and add slowly. Cool and add baking powder and salt. Mix well and add the rice or potatoes. Bake in greased shallow pan in hot oven 30 minutes. Mix together flour, baking powder and salt; add milk and water, sugar or corn syrup and nutmeats or raisins; mix well and put into greased loaf pan, allow to stand 30 minutes in warm place. Bake in moderate oven 40 to 45 minutes. Sift together dry ingredients, add milk and melted shortening. Knead on floured board; shape into rolls. Put into greased pans and allow to stand in warm place 20 to 25 minutes. Bake in moderate oven 25 to 30 minutes. Sift flour, baking powder and salt into bowl; add peanut butter and sugar or syrup and mix. Add the milk and mix well. Bake in greased loaf pan in moderate oven 30 to 35 minutes. This is best when a day old. Cut into thin slices, it makes very good sandwiches. 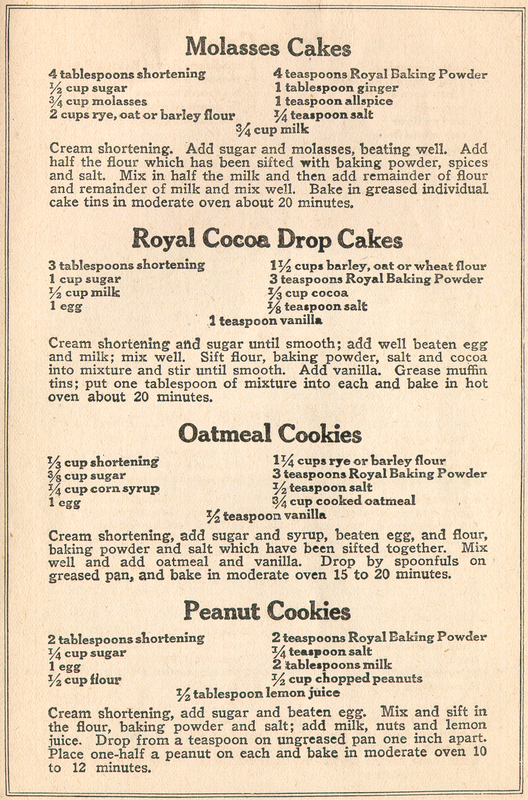 Mix and sift dry ingredients, add the molasses and milk. Beat thoroughly and put into greased moulds 2/3 full. Steam 3 1/2 hours, remove the covers and bake in oven long enough to dry the top. Save 1/4 cup measured flour for board. Pour scalded milk over corn meal, add shortening and salt. When cold, add sifted flour and baking powder. Roll out lightly on floured board. Cut with biscuit cutter and bake in greased pan in hot oven 15 to 20 minutes. Mix oatmeal with sifted flour, baking powder and salt; rub in shortening, add milk and mix, forming a soft dough. Roll out lightly on floured board. Cut with biscuit cutter and bake in hot oven 12 to 15 minutes. Sift flour, baking powder and salt together. Rub in shortening; add the mashed potatoes and milk enough to make a soft dough. Roll out lightly on floured board and cut with biscuit cutter. Bake in moderate oven 15 to 20 minutes. Sift dry ingredients together. Rub in shortening and add milk enough to make a soft dough. Roll out on board to about one-half inch thick and cut with biscuit cutter. Bake in very hot oven 15 to 20 minutes. Sift flour, baking powder and salt together; add peanuts. Cut in shortening; add liquid slowly to make a soft dough. Roll out lightly on floured board; cut with biscuit cutter and bake in greased pan in hot oven 10 to 12 minutes. Mix and sift dry ingredients; add milk and melted shortening and beat until smooth. Bake in greased muffin tins in hot oven 20 to 25 minutes. Sift together flour, baking powder and salt. Add cold sweet potatoes which have been lightly mashed or put through a ricer. Add beaten egg and liquid, mixing well. Bake in greased muffin tins in moderate oven 25 to 30 minutes. Mix together hominy, salt, melted shortening, beaten egg and milk. Add flour which has been sifted with baking powder. Beat well and bake in greased muffin tins or shallow pan in hot oven 25 to 30 minutes. Sift dry ingredients into bowl; add milk and melted shortening and beat well. Bake in greased muffin tins m hot oven about 20 minutes. Scald the milk and pour over the corn meal; add the shortening and sugar or syrup. When cool add the rice, and the flour, salt and baking powder which have been sifted together; add beaten egg. Beat well and bake in greased muffin tins in moderate oven 20 minutes. Sift dry ingredients; add melted shortening, corn syrup, and milk; add well beaten egg; and beat well. Bake in greased muffin tins in hot oven 25 to 30 minutes. Mix and sift dry ingredients; add milk and melted shortening and beat until smooth. Bake in greased muffin tins in hot oven 25 to 30 minutes. Sift dry ingredients. Add beaten egg and milk enough to make a thick batter. Beat well; add melted shortening and blueberries which have been dusted with flour. Bake in greased muffin tins in hot even 20 to 30 minutes. Press rice through sieve and add well beaten yolk of egg, and flour, baking powder and salt which have been sifted together. Mix well and add milk which has been scalded and cooled. Beat thoroughly. Add stiffly beaten white of egg and bake on hot griddle or in waffle iron. Scald corn meal in bowl with boiling water; add milk melted shortening and molasses or corn syrup; when cool add flour, salt and baking powder which have been sifted together; mix well. Bake on hot greased griddle until brown. Sift together buckwheat, baking powder and salt; add milk slowly; beat well and bake on hot greased griddle until brown. Serve hot with honey or syrup. Sift dry ingredients together. Stir in the milk, syrup and melted shortening; beat well. Put into two greased layer cake tins and sprinkle over the top a mixture consisting of one tablespoon cinnamon, two tablespoons brown sugar, one tablespoon shortening and one-half cup chopped nuts. Bake in moderate oven from 15 to 20 minutes. Save about 1/2 cup of measured flour for board. Beat egg and sugar together; add potatoes and milk; add flour, baking powder, nutmeg and corn meal which have been sifted together; chill and roll out, using as little flour on the board as possible. Cut and fry in deep fat. Drain and dust with powdered sugar. Boil sugar, water, fruit, shortening, salt and spices together in saucepan 3 minutes. When cool, add flour and baking powder which have been sifted together. 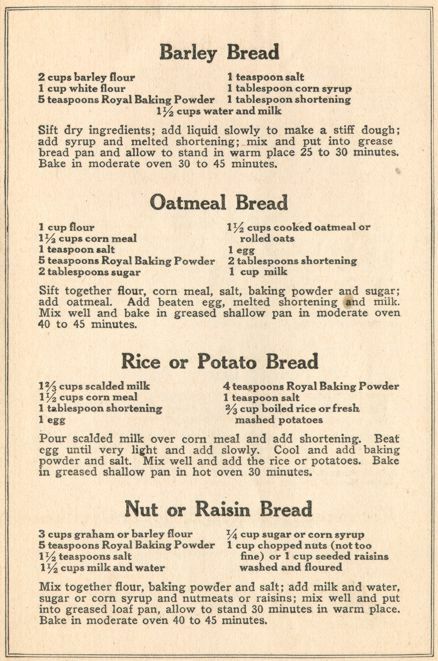 Mix well; bake in loaf pan in moderate oven about 45 minutes. Cream shortening; add sugar and melted chocolate. Add one-half the flour which has been sifted with the baking powder and salt. Mix well and add the milk; add the remainder of the flour, vanilla and the nuts which have been chopped. Bake in greased loaf pan in moderate oven 35 to 45 minutes. Cream shortening, add sugar or syrup, and milk. Mix well and add the flour which has been sifted with the spices and baking powder. 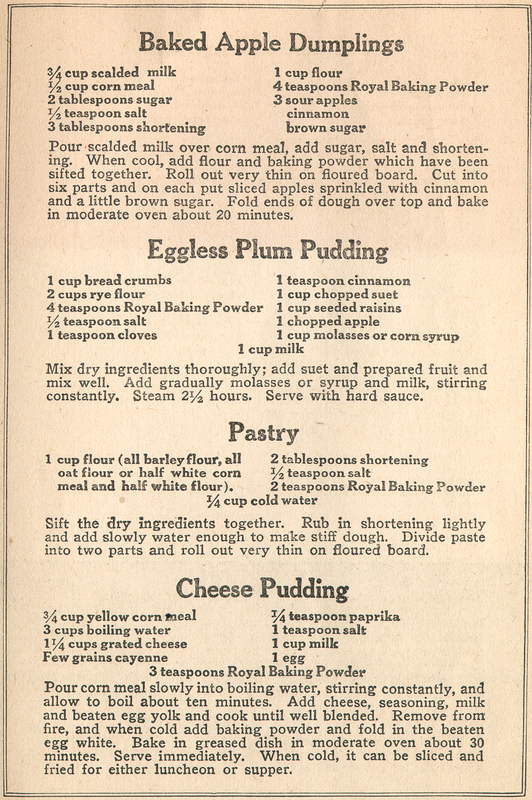 Add the prunes and mix well. Bake in greased loaf pan in hot oven 30 to 35 minutes. Cream shortening, add sugar and well beaten egg. Add one-half the dry ingredients which have been sifted together. Add the milk and mix well. Then add the remaining dry ingredients and the citron. Bake in greased loaf pan in moderate oven 35 to 40 minutes. Boil sugar and water until syrup spins a thread and add to the stiffly beaten whites of eggs, beating until the mixture is cold. Sift together three times flour, salt and baking powder; beat yolks of eggs until thick. Add a little at a time, flour mixture and egg yolks, alternately to white of egg mixture, stirring after each addition. Add 1/2 cup cold water and flavoring; mix lightly and bake in moderate oven about one hour. Cream shortening, add sugar and well beaten egg. Add dry ingredients which have been sifted together. Mix well and add milk. 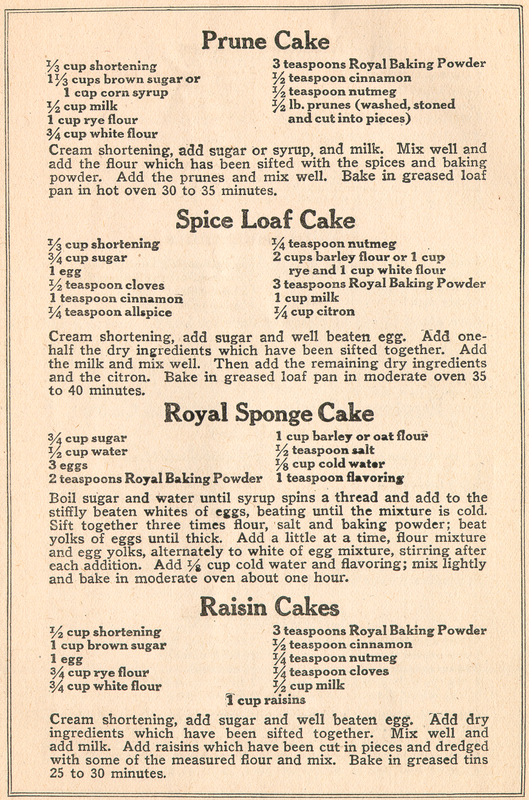 Add raisins which have been cut in pieces and dredged with some of the measured flour and mix. Bake in greased tins 25 to 30 minutes. Cream shortening. Add sugar and molasses, beating well. Add half the flour which has been sifted with baking powder, spices and salt. Mix in half the milk and then add remainder of flour and remainder of milk and mix well. Bake in greased individual cake tins in moderate oven about 20 minutes. Cream shortening and sugar until smooth; add well beaten egg and milk; mix well. Sift flour, baking powder, salt and cocoa into mixture and stir until smooth. Add vanilla. Grease muffin tins; put one tablespoon of mixture into each and bake in hot oven about 20 minutes. Cream shortening, add sugar and syrup, beaten egg, and flour, baking powder and salt which have been sifted together. Mix well and add oatmeal and vanilla. Drop by spoonfuls on greased pan, and bake in moderate oven 15 to 20 minutes. Cream shortening, add sugar and beaten egg mix and sift in the flour, baking powder and salt; add milk, nuts and lemon juice. Drop from a teaspoon on ungreased pan one inch apart. Place one-half a peanut on each and bake in moderate oven 10 to 12 minutes. Beat egg yolk and white separately. Cream sugar with melted shortening. Add egg yolk, syrup, salt and oatmeal. Then add baking powder, white of egg and vanilla. Mix thoroughly, drop on greased pan about half teaspoon to each macaroon. Allow space for spreading. Bake about 10 minutes in moderate oven. Cool before removing from pan. Cream the shortening, add syrup and beaten egg. Add one-half the dry ingredients which have been sifted together. Mix well; add hot water and remainder of dry ingredients. Wash and flour the raisins and add with the nuts to the first mixture. Drop by spoonfuls on greased tin and bake in moderate oven 15 to 20 minutes. Boil honey for five minutes and add slowly to the stiffly beaten egg white, beating constantly until cold. Pour over strawberry short cake and serve at once. Pour scalded milk over corn meal, add sugar, salt and shortening. When cool, add flour and baking powder which have been sifted together. Roll out very thin on floured board. Cut into six parts and on each put sliced apples sprinkled with cinnamon and a little brown sugar. Fold ends of dough over top and bake in moderate oven about 20 minutes. Mix dry ingredients thoroughly; add suet and prepared fruit and mix well. Add gradually molasses or syrup and milk, stirring constantly. Steam 2 1/2 hours. Serve with hard sauce. Sift the dry ingredients together. Rub in shortening lightly sad add slowly water enough to make stiff dough. Divide paste into two parts and roll out very thin on floured board. Pour corn meal slowly into boiling water, stirring constantly, and allow to boil about ten minutes. Add cheese, seasoning, milk and beaten egg yolk and cook until well blended. Remove from fire, and when cold add baking powder and fold in the beaten egg white. Bake in greased dish in moderate oven about 30 minutes. Serve immediately. When cold, it can be sliced and fried for either luncheon or supper. 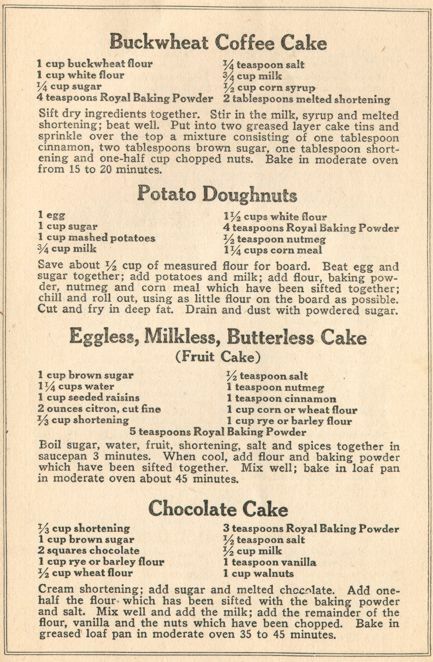 For those of you who wish to verify recipes: Click on the small (about 48 Kb) or large (about 2300 Kb) image. Click on large only if you can not read the small one. allspice: Jamaica spice (in the myrtle family) that tastes like a combination of cinnamon, cloves, and nutmeg. hard sauce: butter, sugar (any type), and a flavoring (brandy, rum, whiskey, vanilla extract, etc.) beat until creamy. It is cooled until it is the consistency of butter.